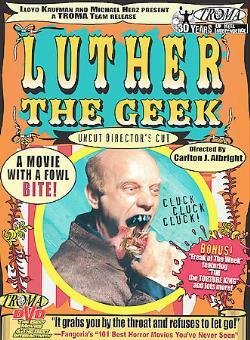 In Illinois, 1938, as a child, Luther gets embroiled in a baying mob watching some random geek biting off a chicken’s head. 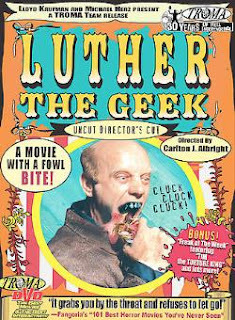 In the present, Luther, (billed as “The Freak” and played by Edward Terry) sports metal dentures and a bald head ; released on parole after a 25 year jail sentence, he immediately begins eating raw eggs in supermarkets and biting out the throats of grannies at bus stops. Although it sports a pantie-sniffing, clucking, squawking villain who does his stalking while sounding like a demented chicken, this Troma release plays everything surprisingly straight and opts for suspense and scares rather than goofy humour. Writer-director Carlton Albright has an eye for uniquely gruesome detail (Luther pulling his dentures out from one guy’s grisly throat wound) and, at a tame time for U.S. horror, doesn’t shy away from bloody make up FX. He also riffs nicely on the then-worn-out slasher formula, setting Luther’s main rampage in and around a single house and pulling off a surprise switcheroo in terms of who survives. Terry’s extraordinary central performance as Luther dominates the movie, though it’s worth noting that ill-fated Stacy Haiduk (who takes a gratuitous shower) is one of the hottest girls of 80’s horror cinema. This movie also has a uniquely downbeat ending in which heroine and villain cluck at each other before the movie closes on a note of suitable insanity. It deserves to be far better known.